Ease of use is one question at play when considering a Marketing Automation platform. However, asked in isolation, it is probably not the right question. Easy, compared to what? When it comes to software platforms, ease of use is a debatable topic. It’s a spectrum and people fall from one of of the spectrum to the other. Software companies generally complete mountains of User Acceptance Testing (UAT) to ensure the platform is easy to use and makes sense. However, when moving from one platform to another people’s point of reference is usually only what they were using before. This means every discussion is limited to what was used previosuly. In the world of CRM moving from Siebel to Salesforce is a significant change. Moving from Mail Chimp to Eloqua is a massive change. I.T. and change management teams have their work cut out for them in making this change as easy as possible for users. My experience has shown that avoiding hypotheticals and working on “real world” tasks as part of end-user training is the key and will make a significant difference. I’ve personally supported 30+ customers on their journey to what Eloqua calls “Modern Marketing”. The Eloqua platform provides a rich range of features and functionality to help you achieve just about anything that you need to. My approach is to generally start out with the fundementals of Eloqua and Marketing Automation. The first is that Eloqua is not simply an “email marketing” platform. Email marketers are generally functioning in a “batch and blast” world. They have a list, they have a message and bang, the list is sent the message – game over. However, they will often repeat this process over and over. It’s a numbers game, of the millions of people they hit with an offer or message, statistically they should get a response. 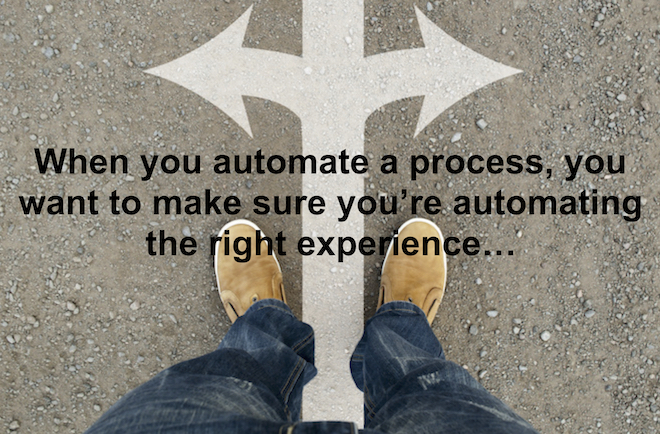 Marketing Automation users are generally more focussed on the indivudals that make up a segment (list). They’re looking to support people on their journey, this may be a buyer’s jouney or it could be as part of an on-boarding journey for new customers. Eloqua provides users with the ability to gauge and act upon what we call Digital Body Language™. Digital Body Langauge™ is the ability to understand what an individual is doing in the context of your campaigns across your various digital properties. Are they opening your emails? Are they clicking through to landing pages and other websites? Are they submitted forms? Are they looking at specific pages on your website that would indicate a high level of interest in your products or services? Just as you can oberserve the body language of a person in a face to face meeting and make certain assumptions about them, Digital Body Langauge™ allows you to do the same thing across your digtial properties and campaigns. I use Mail Chimp to deliver comms for a not-for-profit business association I work with. We sent an email to the entire data base for an upcoming event. One list, one email. I waited for about a week, I then had to go into Mail Chimp and manually create a new list (or segment) to find out who did not open the first email. I copied the original email, edited it sligthly and then built a new campaign with this new list and new email. To replicate the two campaigns above, this would be a single campaign with one segment in Eloqua. Eloqua automatically waits for a period of time that I determine, it knows who did and did not open the first email and will automatically engage those who did not open the first email with a repeat email that I created. Take it a step further and Eloqua can manage the entire event automatically. It can capture registrations, send confirmation emails and then reminder emails to those who have registered. You may also build into the campaign “Last Chance To Register” emails to those people who Eloqua knows have not registered. If you’re organised, you can event automate post event communications. The only thing you need to do is tell Eloqua who physcially attended. It’s a great platform, but it still requires some help to know who physcially attended your event. The screen shot above is of the Eloqua Campaign Canvas. The Canvas provides a visual representation of your campaign, think of it as a workflow. I often work with customers and help them plan out their campaigns using the campaign canvas. It may it easy to see how the campaign will unfold and provides a simple way to route campaign members on a specific journey based on their engagement with you with insight into their Digital Body Language™. So, is Eloqua easy to use? I think it is, it took me a while to undertand the connection and relationship of the many aspects of Eloqua. However, I generally find that when I’m working with customers and they ask “Is X possible?”. I’m more often than able to say “yes, we can do that”. What Oracle Marketing Cloud Eloqua has been able to do, in my opinion, is take what can be complex and create an easy to use and a very graphical interface to help you achieve the results you need to. One idea for Content, it’s just a matter of asking a few questions	A new year, a new start. What will you do differently?